When I see the incredibly productive, large and healthy dark green leaves of collards and kale growing on the ECHO farm, I get excited about introducing these tasty, easy to grow, nutritious friendly plants to you! Eating a good helping of collard greens or turnip greens makes me feel like a surge of vitamins is flowing through me! In the town of Pignon, Haiti, where I visited last month, dark green leafy vegetables were definitely lacking in the market and in the farmers’ fields. Cabbage was the main crop in the irrigated valleys, but it is the dark, leafy members of the mustard/cabbage family that I am promoting in this article. These dark green leafy vegetables (DGLV) can deliver a power punch in our diet. Dark green leafy vegetables are good sources of vitamin A, vitamin C, riboflavin, folic acid, carotenes, iron, calcium, magnesium and potassium. DGLV are sources of trace minerals that take part in key enzymatic reactions in our body. They also are great sources of fiber. As a rule of thumb, the darker the leaves, the higher the nutrients. In many developing nations, children suffer from vitamin A deficiency, which can result in the loss of eyesight. Improved vitamin A nutrition from vegetables becomes an effective way to combat this problem. Other remarkable benefits of consuming DGLV include less chance of developing coronary disease and colon cancer. Although often eaten raw, proper cooking methods can preserve 90% of the nutrients while causing the flavor to become more concentrated and sweeter. Cooking also breaks down the cellulose and makes it more digestible. Cooking with vinegar helps to counter the bitter tastes of some of the DGLV. Most people in the world have access to local dark green leafy vegetables. For example, amaranth leaves, chaya, moringa, katuk, and even lamb’s quarters are important DGLV. Some of the more common DGLV in the United States include: Swiss chard, chicory, collards, arugula, pak choi, radish greens, turnip greens, dandelion greens, kale, mustard greens and spinach. The focus of our discussion will be on the Mustard family (Cruciferae/ Brassicaceae), and in particular the Brassica genus. The Mustard family contains 380 genera and 3,000 species. Plants are characterized by pungent flavor and four-petaled flowers arranged in a cross pattern. The genus Brassica is the largest natural grouping in this family. Table 1 shows some of the common varieties. The cabbage–like vegetables (Brassica oleracea) have a variety of shapes, tastes and color. Kale, collards, kohlrabi, cauliflower, broccoli and Brussels sprouts are all the same species. Differences among them are the result of thousands of years of selective propagation. From as early as the 5th century BC, kale and collards have been a cultivated vegetable crop. All of the brassicas grow quickly and mature in about two months. Both kale and collards like soil with a pH of 5.5 or higher, so add lime if the soil is acidic. This will also supply needed calcium to the plant. Although quite hardy, B. oleracea may be susceptible to aphids and cabbage loopers. It tends to be resistant to most diseases. Collard Greens, Brassica oleracea var acephala or viridis (acephala means without head), have an earthy flavor and are rich in vitamin C, A and calcium. Plants have wide, smooth, blue-green leaves (see Figure 1), and are a popular winter green in home gardens of the southern U.S. Collards can withstand heat much better than many of the other brassicas. Most likely originating in the Mediterranean and Asia Minor, collards and kale have been enjoyed as a cooked green for over 2,000 years. Confucius mentioned the cabbage family as early as 497 BC (www.vegparadise.com), and many brassicas are an integral part of Asian diets. The collards and kale we eat today are, in effect, primitive cabbages that have been retained through thousands of years. Although more highly developed forms of cabbage, such as cauliflower, broccoli, and head cabbage, have been produced in the last two thousand years or so, the kales and collards have persisted, keeping their original primitive traits. They continue to be popular vegetables. Figure 1: Collards growing in the rooftop garden at ECHO. Collards can grow in poor soil and prefer drier soils. They are easy to grow as long as the crop is fertilized and watered in the early stages. The plant can withstand temperatures as low as –9ºC (15ºF). They are frost tolerant but can also thrive in warm weather. The quality and taste of collards are better when the weather is not too hot. If eaten raw, harvest the sweeter younger leaves. Collards can be cut into small thin pieces and boiled until tender, then added to soups or stir-fried. They can be boiled and simmered with onions, garlic and lemon juice. Collards flourish in almost any climate and are one of the most nutritious greens. Kale, Brassica oleracea var acephala (synonym viridis), is rich in vitamin A, C, calcium, folic acid, and potassium. It is very similar to collards except for taste and appearance. Kale leaves are fringed and have longer petioles. It is the hardiest of the Brassicas and will withstand severe frosts. It will also grow in the subtropics and at higher elevations in the tropics. Pick the outside leaves, as the plant produces new leaves from inside out. Kale will thrive with well-manured soil and is drought tolerant. In the appropriate climates, where seeds will set, they are harvested and stored like collards. Kale, which is now available in many varieties, is somewhat bitter in taste. Eat it with vinegar-based dressings to counter the bitterness or combine with other, sweeter ingredients, such as caramelized onions. Smaller leaves have a milder flavor, can be cooked whole, and have stems tender enough to eat. With larger leaves, you will need to cut out and discard the stems and petioles, and then chop the leaves into small pieces. Cool growing weather, fall frosts, and mild winters improve the sugar content and flavor. In some places in Kenya, people have chopped kale and collards, dried them, and stored them for later use. Kale can be added to soups, stir-fry and sauces. Kale and collards are among the easiest of all vegetables to grow. Both of these humble, heroic, “headless” members of the cabbage family have ancient roots and a long history of cultivation. Nutritionally speaking, kale and collards are superstars! Making friends with these two leafy greens is a good idea. Pak choi (Bok Choy), Brassica oleracea var chinensis, is an extremely versatile Asian cabbage which can be boiled, sautéed, steamed, braised, stir fried or eaten raw in salads. There are four major types of pak choi identified by appearance: Chinese white stem; Soup spoon type; green-stemmed and Squat Canton type (www.dpi.gld.gov .au /horticulture). The most popular are the white stem and green-stemmed types. Pak choi is a cool season crop, and like the other cabbages will bolt in high temperatures and increasing day lengths. Some varieties will tolerate both heat and cold. The seeds are very small and should be sown in flats and thinned in 15 to 30 days. Transplanting may reduce bolting in the summer. 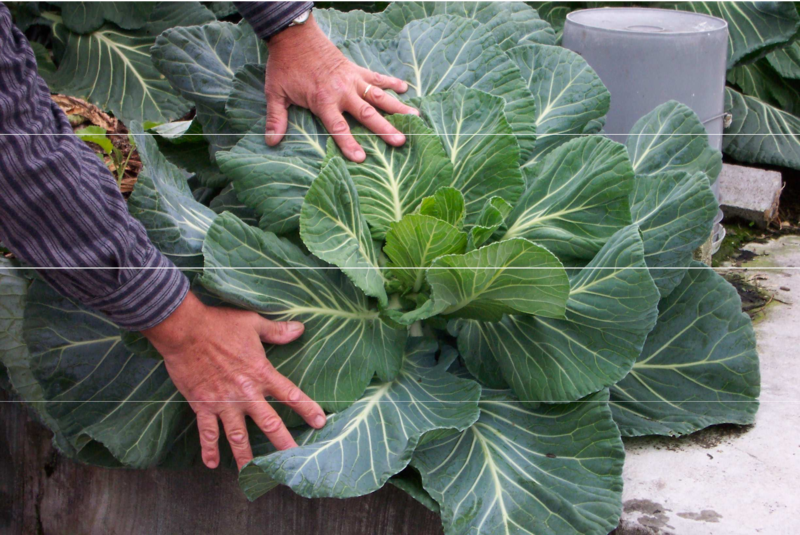 Like all cabbages it prefers good drainage, moist soil and good air circulation for the roots. Pak choi can be harvested 35 to 55 days after sowing. Mustard Greens, Brassica juncea, are a cool season annual. B. juncea has been developed into many different varieties especially in China. It was cultivated in Europe and Asia for thousands of years. Mustard greens have a hot spicy flavor and are rich in vitamin A, C and calcium. Mustard greens are best eaten raw in salads, or in stir-fry and soups. This mustard is grown for its green leaves (in contrast to the mustard Brassica nigra from which we get the mustard condiment). The leaves of B. juncea have a sharp flavor when eaten raw; cooking makes them taste milder. In Florida, we plant mustard greens in September or October and can plant a second crop in January. These leaves mature quickly— usually in thirty days! Harvest the leaves as soon as possible, as the plant will bolt and go to seed quickly. You can plant a succession of crops or cut the plant at soil level and let it produce new leaves. It will withstand temperatures as low as –4ºC but not temperatures above 29ºC. It will bolt more quickly at higher temperatures and as day length increases. The mustard seed can be made into a paste. Mustard greens have no serious pests. Turnip Greens, Brassica rapa var rapa, have been developed for their edible roots and/or leaves. The turnip roots come in many shapes and colors. They are extremely high in calcium and fiber, and can grow to be 2 to 3 pounds at harvest. Like other greens in the cabbage family, turnips have been cultivated for over 2000 years. They are not very popular in America and are sometimes snubbed as a food for poor people and livestock. However, they are an important food source in much of the world. Turnip plants produce high quality forage if harvested before heading. Turnips are easy to grow and adapted to almost any soil. They are one of the most cold tolerant of vegetables (to temperatures as low as 15ºF/ ºC. Sow the seeds thickly and then thin to about 4 inches apart. Turnip greens are ready to harvest in 5 to 7 weeks. Take a few leaves from each plant and they will continue to grow new leaves and develop roots. The greens can be frozen like spinach. They are usually served with vinegar or hot sauce and can also be used in stir-fries. Ethiopian Kale (also called Abyssinian cabbage or mustard collard), B. carinata, is a leafy green that is cultivated in parts of East Africa. The flavor is milder than collards and mustard. It is one of the few Brassicas that can tolerate higher temperatures. One key feature is that it will set seed in the tropics, whereas most other brassicas will not. The plant was imported to the US from Ethiopia in 1957 (Stephens, http://edis.ifas.ufl. edu/MV096) and is also used in Europe under the trade name "Ethiopian rapeseed." Ethiopian kale produces quite well at ECHO in Florida. This variety is unknown in the wild. It is cultivated in Ethiopia as a vegetable and as an oil crop. In India, B. carinata has been shown to significantly out yield mustard (Brassica juncea) under rain fed conditions. Higher production of seed and oil was seen in comparison to other mustard plants. This plant has potential as an oil crop in hotter, drier climates. Table 2: A comparison of the amount of various nutrients in 100g of selected Brassica varieties. *One fresh orange contains 180 mg of Vitamin C. Nutritional information from http://www.nal.usda.gov/fnic/foodcomp /search/index.html. Different leafy green vegetables provide different amounts of nutrients. Table 2 shows a chart with the amount of calcium, fiber, and iron in a 100g serving of each chopped raw green in comparison to spinach. These DGLV provide vitamins and nutrients that supplement the protein and energy from maize, rice, wheat and cassava. They also offer farmers a chance to generate income. DGLV can be used to produce biodiesel, oil that can be used as a fuel. Brassicaceae oils are ideal because, in comparison to soy oils, they are relatively low in saturated fats, have a lower pour or melting point, and have better cold flow properties. Currently biodiesel is relatively costly compared to petroleum diesel. Marketing of canola and mustard seed by-products can help reduce costs. The Brassica vegetables that we have in the ECHO seed bank are: collard greens, kale, pak choi, mustard greens, turnip greens, and Ethiopian kale. Although the brassicas are considered cool weather vegetables, some of them (such as collards and Ethiopian kale) will do well in warmer climates. They are fast growing, some can be harvested continuously, and the seeds are easy to save [though only if you live where they produce seeds; collards and nearly all kales will not produce even in Florida]. We offer both hybrid and openpollinated varieties in the seed bank. Trial size packets are available free to those working overseas in agricultural development. All others may purchase the seeds from ECHO. The overseas price is $3.50/packet and the domestic price is $3.00/packet. Please contact us at echo@echonet.org or go to www.echotech.org.